ABC has renewed America’s Funniest Home Videos for the 2014-15 season. It will be the venerable show’s 25th season and it will also be Tom Bergeron’s final season. Bergeron announced his departure in March, noting that he’s been doing the job a long time and he just feels that 15 years on the show is time to step down. He’s assured viewers that his departure isn’t part of any backstage drama and also says that he and producers have been discussing the possibility of him hosting a “live” spin-off of the show on ABC. This could also end up being the last season for AFV. Though the series is very cheap to produce, the ratings have come down quite a bit over the years. What do you think? Do you still enjoy this show? Will you miss Bergeron? Should he be replaced or or should the show be cancelled when he leaves? Tom is a huge part of the show and it being so funny! I will really miss him–it won’t be the same. It’s a fun show that is good for a real giggle when you need it. Please answer this: will Tom’s season finale last show be broadcast at any other times than May 17 at 6pm Central time? 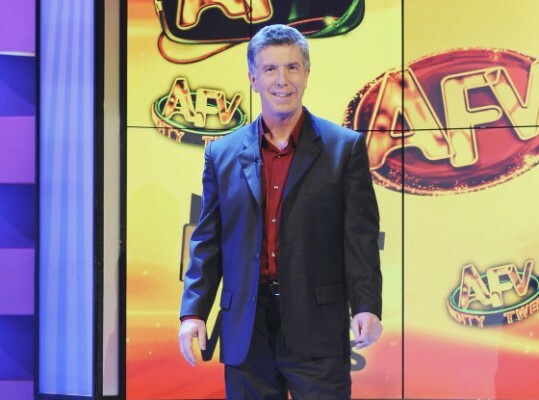 Even though i don’t want the show to end it is diffrent without him we will miss you Tom Bergeron. I can’t believe that one of the funniest, clean and genuinely modest men will be leaving not just AFV, but also DWTS. It’s very difficult to find anything on TV these days that is of good rapor. Now we have to say goodbye to Tom Bergeron the last of a dying breed. Thank you sir for all your wonderful years of service. America’s Funniest Home Videos is one of the best and most refreshing shows on TV! It lifts the spirits of everyone who watches it, and there is far too little pure, unstaged comedy on the air. I ADORE Tom Bergeron. He is a true spontaneous comedian, and would be VERY difficult, if not impossible, to replace. I will miss him immensely! I, Mr. Franklin Thomas Jeffrey Michael McNally, believe that Tom should be replaced. I could see Carrie Ann Inaba replace him. I’d also like to see either Dylan Lane or Bill Engvall replace Pat Sajak as the new host of Wheel of Fortune, eventually. Show is definately not the same without Tom. I have watched him for years and he is funnier than some of the videos! He just has a knack for this program, the other hosts that were prior to Tom we’re boring. Show should just end with Tom, at least it will for me. I wish him well.